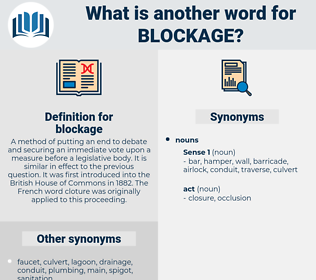 What is another word for blockage? 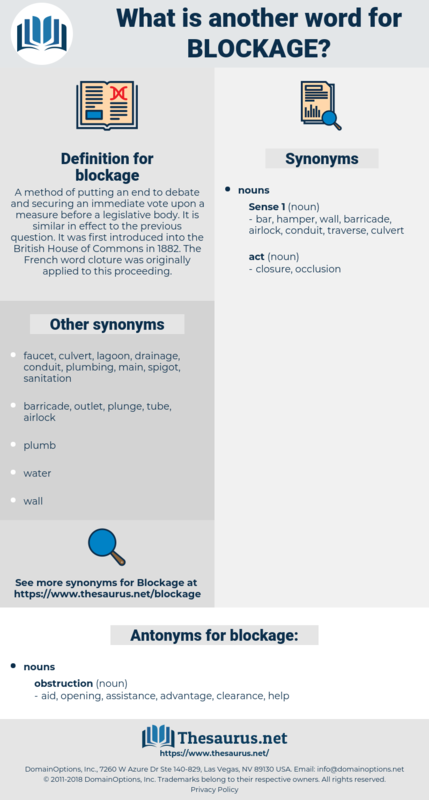 siege, embargo, lock-up, filibuster, locking, freezing, restriction, blockading, hurdle, stagnation, lockout, closure. blockade, blocking, Silting, obstacle, logjam, bloc, stalemate, gridlock, congestion, bottleneck, impediment, impasse, barrier, standstill, freeze, lockup, clog, obstructionism, jam. aid, opening, assistance, advantage, clearance, help. vapor lock, breech closer, stopple, plug, Vapour Lock, breechblock, stopper. ileus, tamponage, intestinal obstruction, tamponade. impedimenta, obstructer, obstruction, obstructor, impediment. physiological state, physical condition, physiological condition.